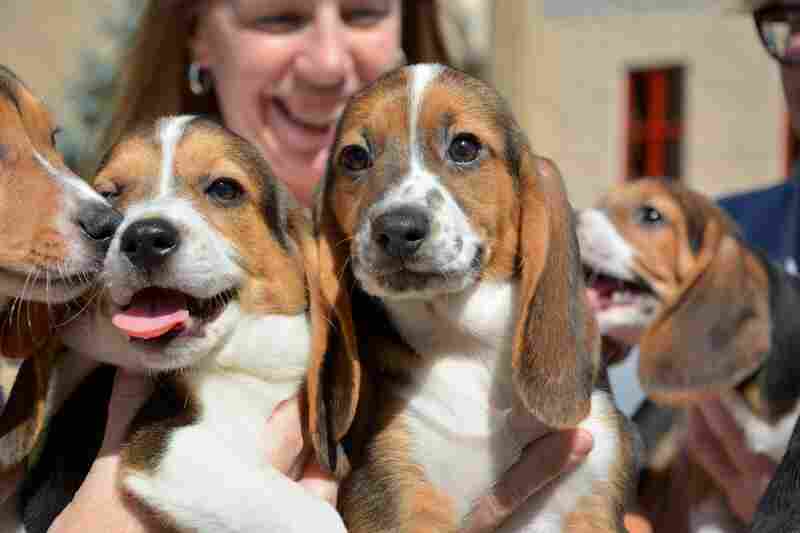 7 Bundles Of Scientific Joy: 'Test Tube Puppies' Prove IVF Can Work In Dogs : The Two-Way While in vitro fertilization has been successfully used in many species (including humans) for decades, scientists have never managed to use the procedure with dogs — until this summer. 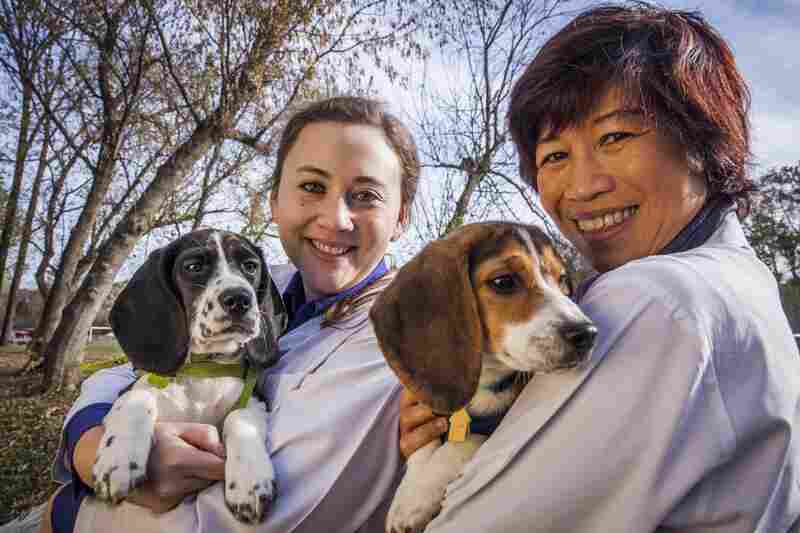 Cornell graduate student Jennifer Nagashima (right) and Smithsonian Conservation Biology Institute research biologist Nucharin Songsasen — lead author and co-author, respectively, of a new paper on IVF in dogs — walk two of the puppies born during their research this summer. 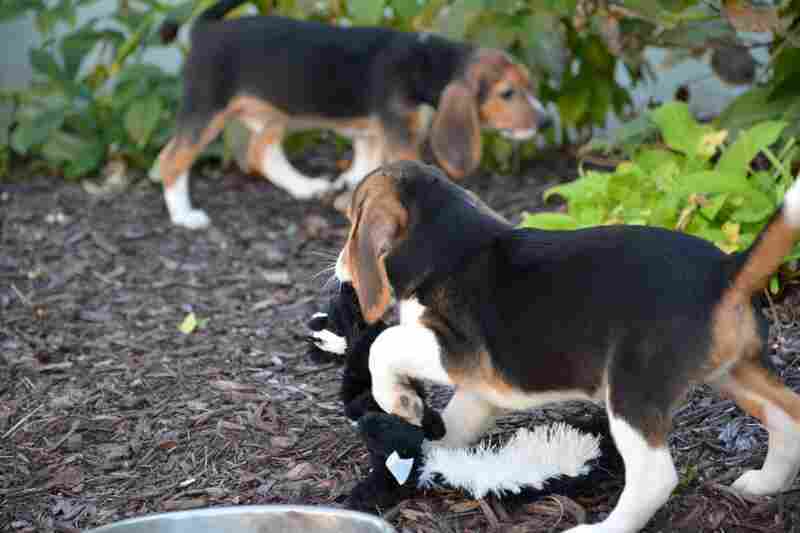 Seven tussling puppies could bring a smile to anyone's face. But one litter has a team of scientists beaming more than usual. 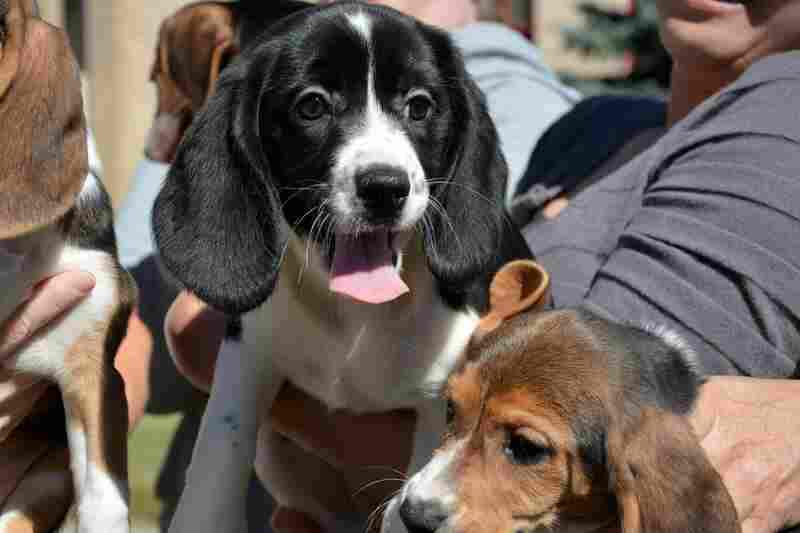 The puppies — five beagles and two "bockers," or beagle-cocker spaniel mixes — are the first ever born through in vitro fertilization. IVF has been used successfully in other animals — including, notably, humans — for decades. But despite numerous attempts, scientists had never succeeded in using IVF in dogs. 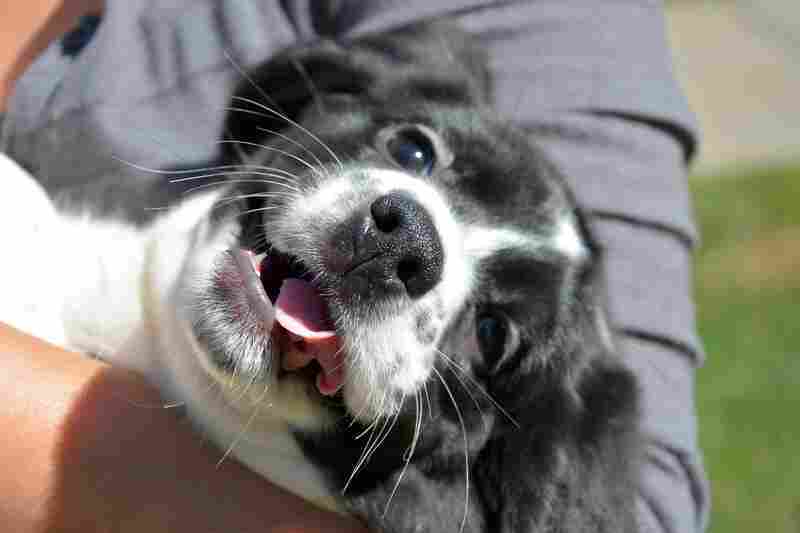 But this year, researchers at Cornell transferred 19 embryos into a female host dog. 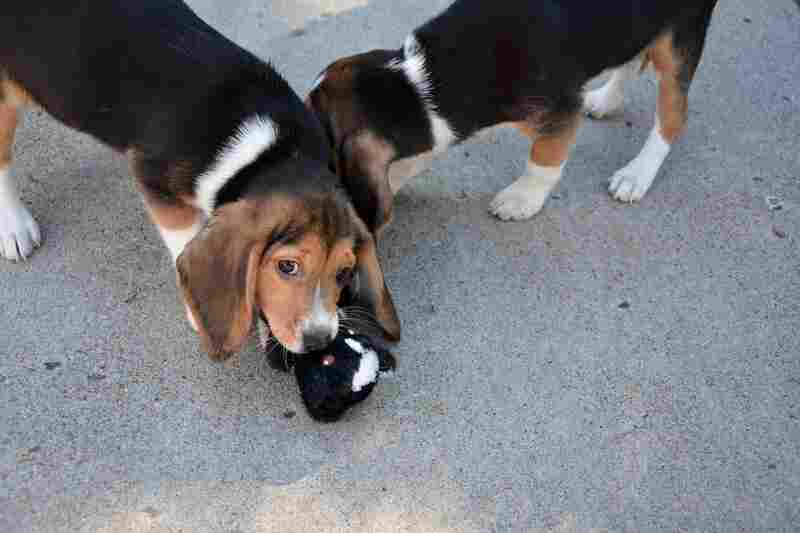 In July, after a scheduled cesarean section, they welcomed seven new puppies into the world. They described the breakthrough in a paper published Wednesday in Plos One. As NPR's Rob Stein reported earlier this year, dogs have successfully been cloned before: In fact, for a cool $100,000, you can have your own pet dog cloned. But where cloning involves transferring one dog's existing DNA into a donor egg, IVF involves the creation of a new genome through fertilization, so each animal has a unique set of DNA. 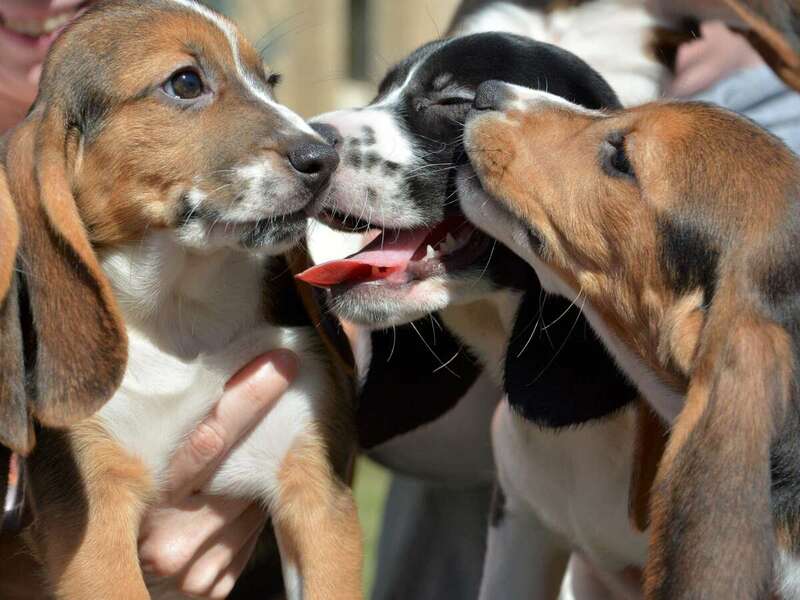 The first litter of puppies born by in vitro fertilization includes two bockers and five beagles, born from two fathers, three mothers and a host mother. Previous attempts to use IVF in dogs had resulted in very low rates of fertilization, and no live births at all after IVF embryos were transferred to a host. There are numerous reasons why, the Cornell scientists explain in their paper. First, female dogs only ovulate once or twice a year. And their eggs appear dark under a light microscope — which makes it harder to see the structures inside of the egg, the scientists note. The eggs are also released before they're fully matured. The Cornell researchers found that if they waited an extra day, compared to IVF procedures for other mammals, before extracting eggs, success was more likely. Adding magnesium to the environment where the sperm and egg met also helped with fertilization, the team found. Once they had successfully created embryos, the scientists froze them until the host dog was ready to become pregnant — a key part of overcoming the difficulty of timing IVF, given how few times a year a dog can get pregnant, a Cornell press release notes. Then, for the first time, the scientists saw IVF puppies carried to term. 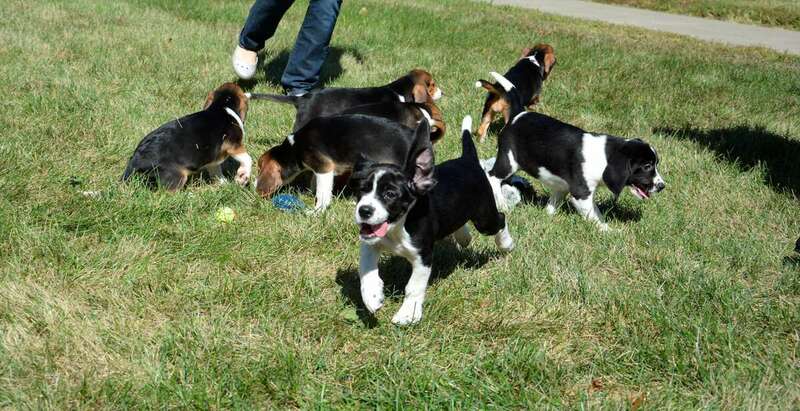 The seven surviving puppies are genetically the offspring of two different fathers (a cocker spaniel and a beagle) and three different beagle mothers, carried by the same beagle host. Cornell graduate student Jennifer Nagashima (left), lead author of the paper, and Nucharin Songsasen of the Smithsonian Conservation Biology Institute, co-author of the paper, hold two of the IMF puppies born this summer. 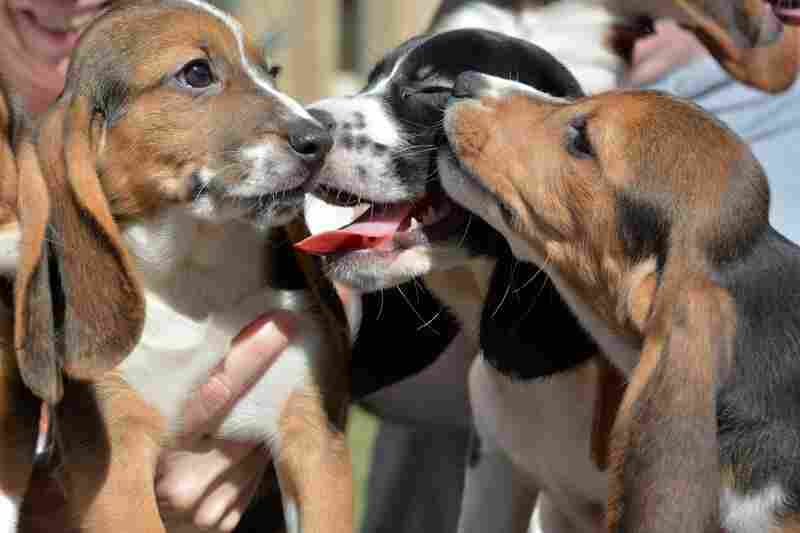 The puppies in this litter are the first ever born through IVF. IVF has been used successfully in many other species, but dogs presented a particular set of challenges. The team behind this project tweaked the IVF process to increase its success rate. The live births are a breakthrough with implications for endangered species management and for disease research. The achievement could eventually help endangered canine species, the scientists say: Frozen eggs and sperm from "genetically valuable individuals" could be used to continue to create offspring after the animals themselves have died. And there are also implications for disease research, the scientists say. Successful IVF procedures will allow scientists to more efficiently explore gene editing in dogs, which could help eradicate inherited diseases. Dogs get spontaneous cancer, like humans do, and pet dogs are exposed to many of the same environmental factors as humans, the scientists note. Overall, they say, dogs share more than 350 disorders or traits with humans — almost twice the number as any other species — so advancing research into canine disease could ultimately help treat humans. "The team used small daubs of coloured nail varnish to tell the dogs apart. Since they were born, all but one has been adopted. Their names are Ivy, Cannon, Beaker, Buddy, Nelly, Red and Green. Travis gave a home to Red and Green, and while Red's name honours the informal name for the Cornell sports teams, Travis says Green has yet to be renamed because his children cannot reach a consensus. Nelly will be homed after she has had her own litter of puppies."